BMW sells F1 team back to Sauber | What Car? 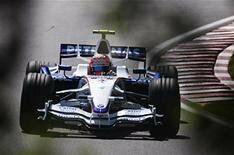 BMW has agreed to sell its Formula One team back to it's previous owner, Peter Sauber. The German car manufacturer bought Sauber's Swiss-based F1 team in 2005, but it announced earlier that it was to pull out of the sport. The sale to Sauber, however, is conditional on the team having a starting place in the 2010 F1 season. Meanwhile, VW is reported to be interested in building F1 engines from 2012 and not to be out-done on the car maker/sports news, Audi has just bought a 9% stake in German football giants Bayern Munich.